Genuine gold brocade embellishes this magnificent silk scarf by Amporn. 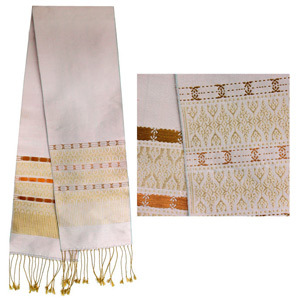 In Thailand this scarf is called "pha sabai," a long and narrow cloth for woman to wrap around one breast with one end draped over one shoulder and hanging down the back. This traditional accessory could be also used as a table runner. This scarf is made with "Pha Mai Yok Dok." 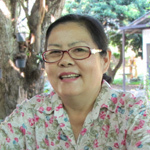 "Pha Mai" means silk and "Yok Dok" is a weaving technique where the patterns are set in the warp with additional pattern heddles placed behind the main heddles and suspended over the warp with a support hung from the frame. For this item, the gold threads are made of finely beaten gold wrapped around a silk core. 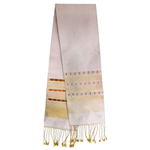 Being handmade with a natural fiber, this scarf may vary slightly in colors, motifs, weight and size. The weave could also show small flaws or joins in the thread.